With all of the cool new features being announced, we’re sure you’ve been hearing the buzz all week about Apple’s WWDC18 conference in San Jose. We’re big fans of iOS and Apple, and we were so excited to be asked to have Actiview featured at the Accessible Technology and Inclusive Design Get Together last night! 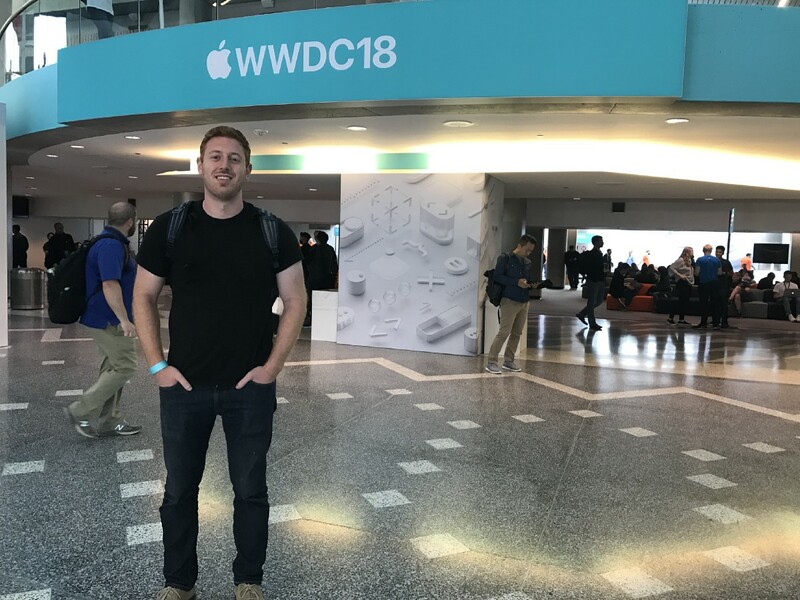 Actiview Founder, Alex Koren at the WWDC18 entrance with the Apple logo and WWDC18 banner in the lobby of the San Jose Convention Center. Some of you might be asking, “What is WWDC?” Well, it’s an annual conference hosted by Apple where 6,000+ developers come from all over the world to learn about the newest technologies and features from Apple. 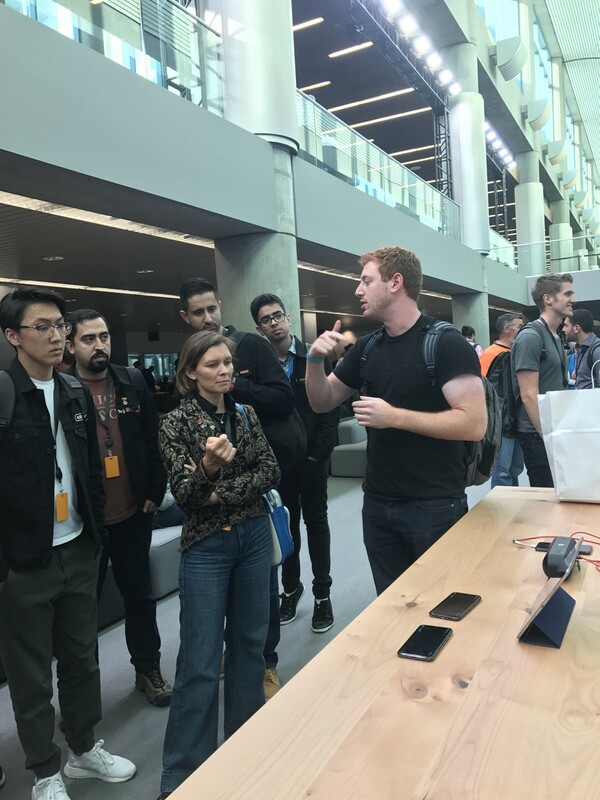 Attendees can participate in hands-on labs with Apple engineers, and in-depth sessions covering a wide variety of topics. Actiview Founder, Alex Koren demos the Actiview app to interested WWDC attendees. As you know, we’ve been working hard to create an easy way to make movies accessible for everyone, regardless of ability, disability, or need. We were so excited to get to share the Actiview app with WWDC18 attendees from all over the world. We were blown away by the amount of people who came by to try the Actiview app, and all of the positive feedback and responses they shared. Thank you Apple for having us! Another great part of being at the WWDC Accessibility Get Together was getting to see all of the other cool technologies that amazing developers have been working on to improve accessibility. Check out the recap of a few of our favorites from the Get Together. 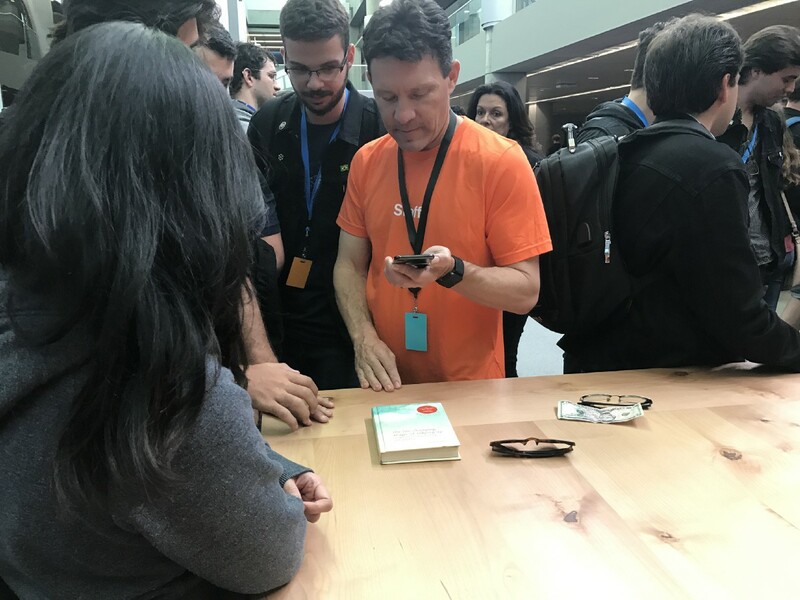 Apple staff member demos Microsoft Seeing AI app on an iPhone to a group of people. The iPhone is placed over the cover of a book so the app can read it and describe it back. 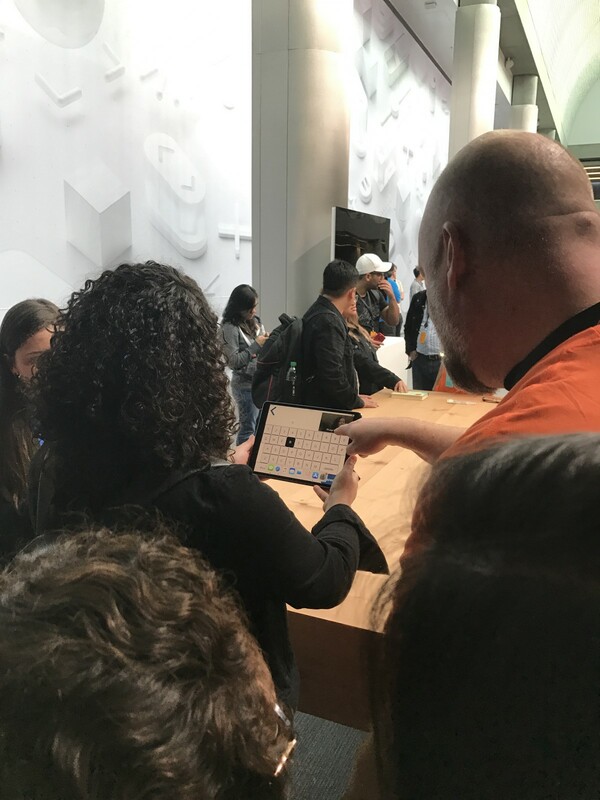 A woman holds an iPad featuring the talkative app as an Apple staff member shows her how to use facial movements to type on a keyboard. Talkative: Assistive Communication Tool — This was a really cool app that featured a voice board to assist with non-verbal communication. Users can simply select words on the voice board, or build entire sentences. In addition, there is a super cool feature that allows people to use facial expressions to type. The app also has image boards for people who are non-communicative or prefer to communicate using images. We got to meet Talkative Founder and Product Owner Juliana Salgado. She’s been tirelessly conducting research and working on the app since 2015. Shout out to Juliana for all of her effort and dedication to make the world more accessible! 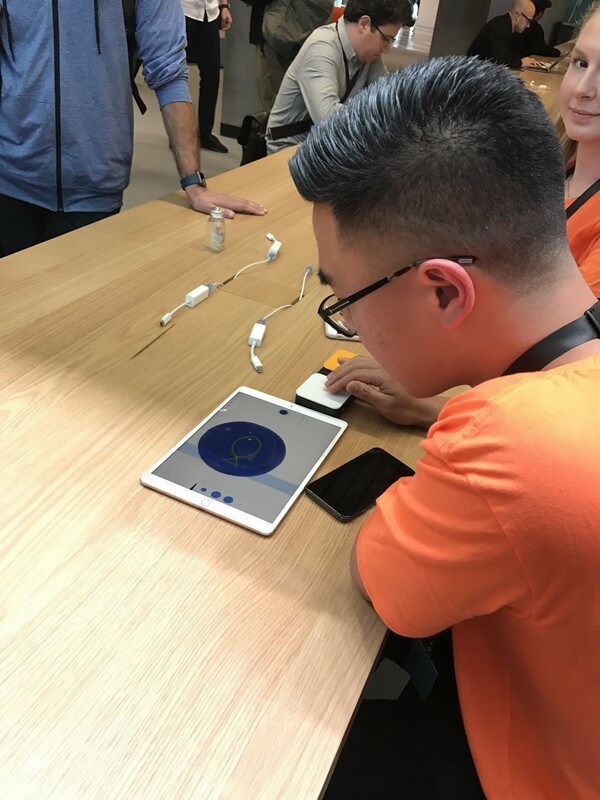 Apple staff member demos the Switch Control feature on the iPad by drawing a fish with a switch board device. Apple Switch Control — Another Apple accessibility feature called Switch Control was being demoed with a person drawing using the feature and a switch board, showing how precise the technology can work. Switch Control is built into iOS and can be a great feature for people with extreme motor impairments. Switch Control can navigate the whole operating system using just 2 switches. There is also a voice over component that can be used. 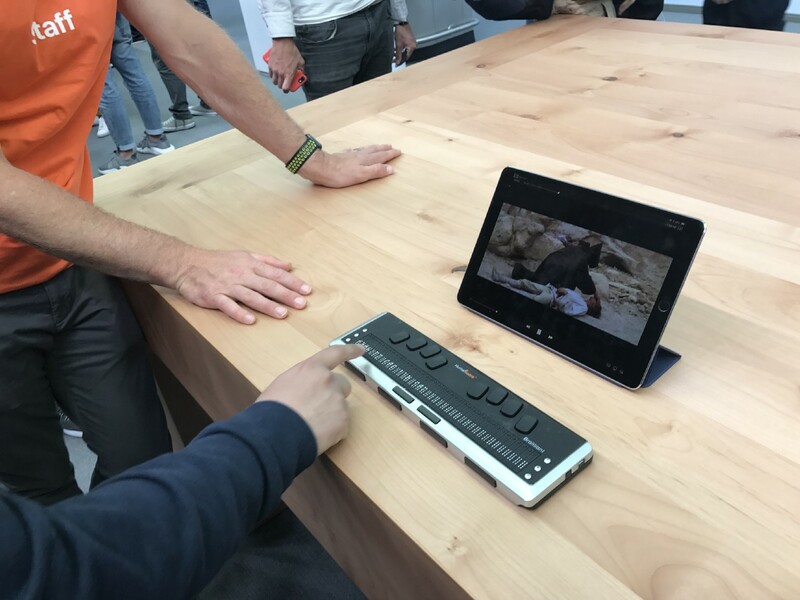 Apple staff member demos the HumanWare braille display to a WWDC18 attendee who touches the brailled keyboard being used with an iPad. HumanWare — HumanWare had a demo of their Brailliant BI 32 (NEW generation) braille display. The braille display is designed for extensive reading. The display is easy to use, portable, and can be used with laptop, desktop, and mobile devices. Other apps and features that were being demoed were Swift Playgrounds — an app for iPad that teaches people to code in a fun way and Athena — an unreleased app by Apple that was created to showcase the accessibility features that can be used when developing education technology. What a great showcase, right?! We were so honored to be featured as part of such a great group of developers and technology that are working to improve access for all. If you want to learn more about the big announcements from the keynote this week, check out the comprehensive list of WWDC 18 Announcements from Business Insider. To learn about new movie releases on the Actiview app and to stay up to date with what we’re working on, follow us on Twitter and Facebook and sign up for updates on our website. And you can always email us to say hello at team@actiview.co. Also, if you haven’t heard already, Solo: A Star Wars Story is now accessible via the Actiview app! Download the Actiview app today and experience Solo: A Star Wars Story with Audio Description and/or Amplified Audio tracks in theaters now! Solo: A Star Wars Story movie poster banner.